Plunging passenger revenues in the middle 1920s caused the McCloud River Railroad to explore alternatives to running traditional passenger trains. The success of a bus line running on the highway between McCloud and Mt. Shasta City at siphoning business away from the railroad caused the company to decide to launch its own bus service. The railroad bought three buses, two Whites and a Studebaker, in 1927 and 1928, and built a bus garage along the east side of the railroad yard to house them. The railroad initially operated the buses directly, but soon decided to separate the off-rail passenger operations from the rest of the company. The railroad incorporated McCloud Transportation Company as a new subsidiary, to which it sold the three buses and the garage. McCloud Transportation Company commenced independent operations on 1 September 1929. While independent, the bus operations continued to appear in the railroad's timetables. The railroad continued this arrangement until February 1937, at which point the railroad liquidated McCloud Transportation Company and repurchased its assetts. 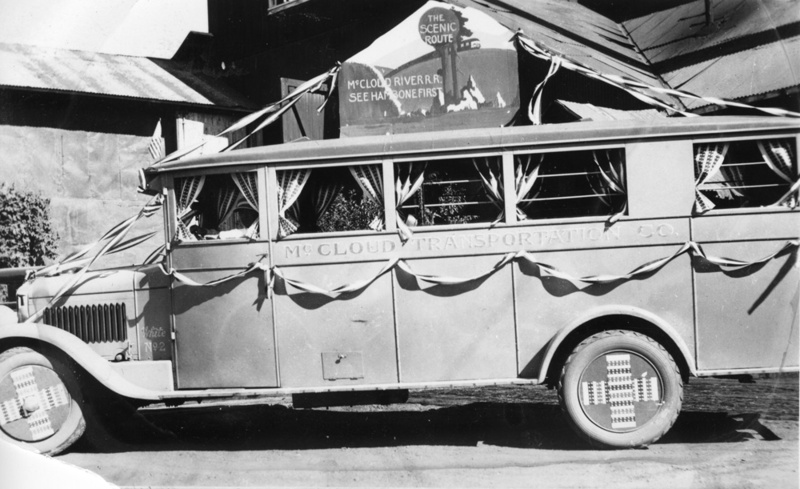 "See Hambone First"- McCloud Transportation Company bus #2, apparently decked out for a parade. T.E. Glover collection. In 1962, Pacific Gas & Electric Company started laying plans for a massive hydroelectric project on the Pit and McCloud rivers. Heart of the project would be two massive new power plants, designated the Pit 6 and Pit 7 Powerhouses, to be built on the Pit River in the Big Bend area. In order to make the project work, the utility would need to divert water from the McCloud River to the Pit, and to that end the project included a new reservoir- named Lake McCloud- six miles south of McCloud that would divert water into aqueducts running through the mountains and an intermediate reservoir on Iron Canyon Creek to the Pit. The bulk of the construction materials for this massive project would be brought into construction bases in McCloud and Burney by rail, and to help facilitate final delivery to the construction sites the McCloud River Railroad incorporated the McCloud River Trucking Company as a subsidiary on 14 June 1962. The new company almost immediately attempted to purchase the operating rights of Zamboni Trucking, also known as ZLS Trucking; ZLS primarily existed to haul lumber for its affiliate Zamboni Lumber Company, operator of a sawmill in Round Mountain, California. However, Federal and state regulators disallowed the transaction on competative grounds. Despite the setback on the ZLS acquisition, the McCloud River Trucking Company forged ahead. The company purchased at least two trucks, a cement truck and a tractor with three flatbed trailers. The cement truck primarily operated from a cement mixer the railroad built in the McCloud yard south to the Lake McCloud dam, while the tractor typically between the Burney yard and the Pit River projects. The trucking company on occassion had to borrow log truck drivers from the lumber company. The trucking company is also reported to have periodically handled some freight to and from the log camps. 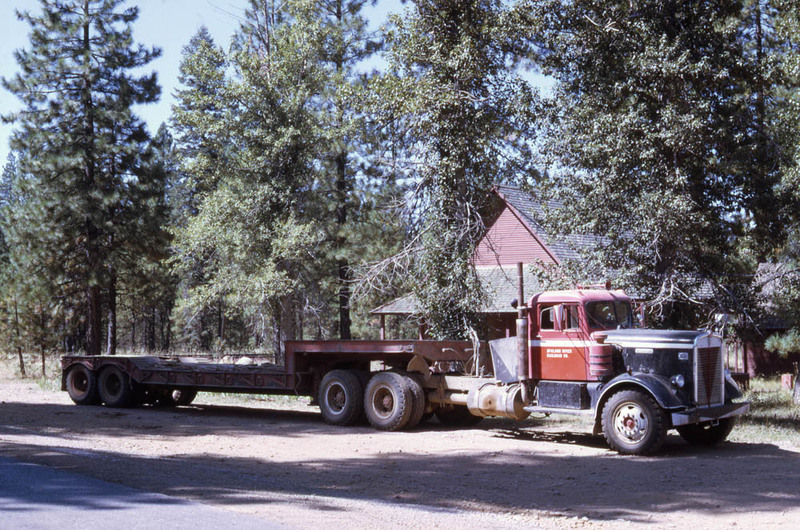 The McCloud River Trucking Company appears to have ceased most business activities by the late 1960s, after construction of the Pit River projects wrapped up. However, the trucks themselves remained in use in railroad projects for some time afterwards, and the company itself remained in existence through the rest of the corporate life of the McCloud River Railroad before finally being dissolved on 17 December 1992, after the sale of the rest of the railroad's assetts to the McCloud Railway Company. The tractor with one of its trailers in Bartle in 1968. Photographer unknown, Jeff Moore collection.